Okay, I admit it. Just like two million other Australians, I was completely hooked on My Kitchen Rules series four. What I discovered was, reality TV borrows from storytelling. It takes the fundamentals of stories, strips them bare and reconfigures everything to maximise audience engagement. So here you have it, the results of my addiction research into writing and reality TV. 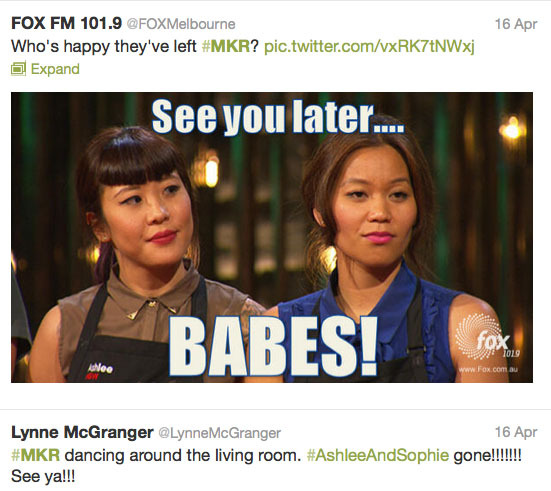 Sofia and Ashlee were generally seen as the villains on My Kitchen Rules. Heroes and villains, nice guys and little battlers, mums and dads, tricksters and the naive. These character types are the building blocks of reality television. Producers of reality television shows choose participants based on stereotypes and the likely assumptions of audiences. Script editors, in turn, edit the shows to manipulate us into thinking certain ways about the characters. Who did you barrack for in the recent series of My Kitchen Rules? Did you see Sofia and Ashlee as the villains, or as strong and sassy young women? Did you prefer Dan and Steph with their average looks and everyday dreams, or the glamorous siblings, Jake and Elle? Reality TV shows like The Biggest Loser encourage viewers to identify with contestants. Whether you like it or not, your readers will identify with your characters, dislike them, or worse still, not care about them at all. I’m not suggesting basing your characters on stereotypes so that readers will identify with them. Instead, you may like to challenge your assumptions. For example, are your characters ‘just like you’ – with the attitudes and beliefs of your class, gender and level of education? Or are they completely different to you, but inauthentic and not grounded in reality because it’s a reality you’ve never experienced? Examining your assumptions about your characters can be a good starting point for developing deeper, more emotionally authentic characters. It could also lead you to consider how your character could change over the course of the story. Reality television thrives on conflict and competition. At times it can seem forced, with endless (and pointless) games and challenges. As viewers, we are constantly reminded that this is a competition. We want our favourite characters to stay in the show. We want the villains to be eliminated. This is the same energy that keeps readers reading our stories. A plot-driven story will contain conflict. There will be obstacles for the heroine to overcome. And in stories based on a competition – the Hunger Games trilogy for example – wanting to know who will triumph and how they will do it keeps readers engaged. Many novice writers are unwilling to allow their protagonists to endure suffering. But if you take a look at reality television, suffering can be what hooks audiences. Suffering tends to reveal essential ‘truths’ about us. It is not the terrible situation itself, but how we react to it. Do the characters really, really want that prize money? Are they prepared to go through all that hard work and effort for the reward at the end? Sometimes, it’s not enough for the characters to suffer through starvation, humiliation and physical challenges. Sometimes, contestants are forced to bare their souls or break down in front of the camera. The Biggest Loser thrives on this. Contestants on this show not only endure extreme physical demands, they are then prodded to reveal themselves psychologically on national television. As the audience, we are then privy to the innermost thoughts and feelings of the characters. We find out what makes them tick, what has brought them to this point, and are left wondering if this person has the strength of character to keep going on the arduous journey. We may even feel empathy for a character we previously disliked. When writing your story, be generous with readers. Let them glimpse into the emotional and psychological state of your main character. Readers want to know. If you don’t believe me, think about how unsatisfying it would be to finish reading a detective story with no insight into why the murderer committed the crime. 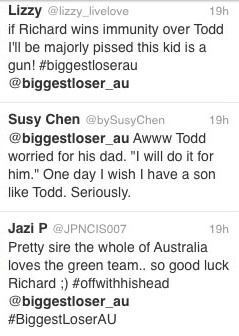 The 2013 season of My Kitchen Rules provoked some viewers into taking a stand against bullying. 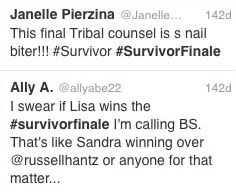 Most reality TV shows are scripted to provoke debate around particular themes. In one season of Survivor, teams were divided by ethnicity. In the recent series of My Kitchen Rules, choosing not one but two teams of Asian women to be cast as the villains prompted debates about racism. Bullying was also a theme that emerged from My Kitchen Rules. It inspired some parents to talk about this serious issue with their kids. The show became a kind of morality play, with the audience debating, heckling and commenting on the action. As a writer, it is useful to think about what themes and issues are important in your story. Being aware of these themes can help you develop your story, and once it is published, provide talking points for readers. In the recent series of My Kitchen Rules, there were so many twists, viewers began to complain. Reality television is full of twists and turns. Who will be eliminated? Who will be undermined? Which previously-eliminated character will get a second chance in the competition? In Survivor, the deviously-plotted ‘blindsides’ are an effective way to build suspense. All too often however, script editors remove all traces of the planning of the twist. This leaves audiences feeling tricked. Don’t treat your readers like this. If you’re planning a twist in your story, make it plausible. By the time the Survivor finale is screened, the audience is hooked. Will your favourite character overcome the odds to reach their goal? Will the villains get their just desserts? Once the foundation of character, conflict, suffering and themes are laid, as a writer you only need add a few twists and turns – and your audience will be well and truly hooked. Did The Biggest Loser contestants keep up their healthy regimes? What on earth went wrong for that Apprentice contestant in the final challenge? Most reality shows give airtime to contestants prepared to share how being on Survivor/Masterchef/The Voice changed their lives. In Survivor, closure is taken to another level – the final episode is a a chance for contestants to have their say about how they were presented, what has happened to them since the show ended, and for audience members to ask questions. In your story, you may decide to show your readers what became of your main character after the resolution. Whether or not you do this will depend on the genre of your story. But is it worth noting how important closure is for audiences. Are you a writer and reality TV addict? What have you learned about writing from the scripting of reality television? 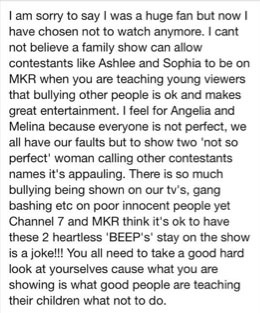 I haven’t seen MKR but I have seen enough ads for other reality shows to share concerns about bullying on TV. I think children’s writers are doing a lot to address this and show children how to deal with it – using the various writing techniques you describe. You’re right – children’s writers are addressing issues like bullying in their stories. I was also surprised to hear (via social media) how parents are using reality shows as examples of ‘how not to behave’ for their children. I think this is a great start to teaching kids to be media literate, as well as showing kids what isn’t appropriate behaviour.